From its earliest beginnings, Baltimore was a city under siege. Although its residents were successful in defeating British invaders, homegrown enemies — yellow fever, consumption, typhoid, and cholera — repeatedly struck at the heart of the city. The urban poor were particularly vulnerable. Inadequate diets, dense housing, poor sanitation, and a variety of environmental ills — lumped into the category of “public nuisances” — reduced their chances of fending off infection. At the same time, the institutions charged with their care were themselves victims of inadequate funding, poor design, and labored under misconceptions concerning the cause and cure of disease. Although the city experienced reoccurring outbreaks of cholera, yellow fever, smallpox, and other infectious diseases, the fear of hospitals in the eighteenth and early nineteenth century was so great that most cases were treated at home until the patient was near death. Nineteenth century public hospitals, both in Europe and the United States, were viewed as a medical means of last resort. Hospital wards were generally squalid, overcrowded, and badly ventilated. The insane, blind, and crippled were housed together with the sick. Since private hospitals often refused to admit contagious or incurable cases as well as those deemed morally unworthy, the local almshouse was usually the only source for medical care. In almshouse infirmaries, little was done to quarantine patients with infectious diseases, who, in turn, could potentially contaminate attending doctors, nurses, and other inmates. Nor were the sexes segregated, and prostitutes, often suffering from a variety of illnesses themselves, set up business in the wards with little interruption. A disproportionate number of cases were chronic, lingering illnesses, such as lung, heart, and kidney ailments, whereby the patient neither died, nor recovered. Patients may have to share beds, sometimes lying among the dead for hours before the corpses were removed. Bed linens were infrequently changed and a new patient might rest in the last patient’s sheets. In the lying-in wards, women had a better chance of surviving childbirth by birthing at home with a midwife or physician than by giving birth in a hospital. 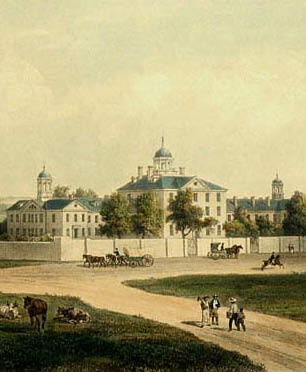 Improvements in the medical care of Baltimoreans was dependent upon the professionalization of doctors and the institutionalization of medical education advocated by the University of Maryland School of Medicine, practiced in its clinical arm, the Baltimore Infirmary, and later adopted by hospitals and medical schools through the city. The introduction of clinical medical was a significant step in medical education and practice, permitting medical students to receive first-hand experience in the diagnosis and treatment of patients, learning through observation and hands-on experience rather than lectures and readings. Incorporating clinical education into the medical curriculum and expansion of teaching privileges in hospitals across the city produced doctors with practical experience in anatomy, clinical diagnosis, and treatment of disease. This shift in medical education and practice gave rise to hospitals that were no longer places to die, but havens to get well.